You know that saying from that Christmas movie, 'just put one foot in front of the other.' 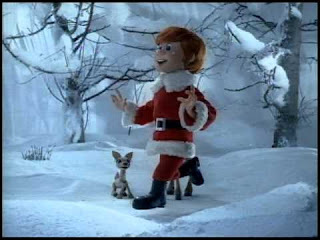 Every now and then I find myself singing it in my head, either because I truly need that Kris Kringle inspiration or my dad engrained it in my head from many years of having to watch all the Christmas specials on cable. I find this saying rings true for a lot of things. I am a planner. I love things to be planned and I love knowing what I am doing in advance. I am organized and particular, yet I also like surprises and being spontaneous sometimes. It doesn't make all that much sense, but as you can imagine, I can get quite anxious about things fairly easy because of this interest in both spontaneity and preparation. This saying often helps me sit back and think about what I am worried about, what I need to get done and reminds me that each step is important, but needs my focus. As long as I am moving, I am going somewhere. We do not reach our goals in one giant leap. It takes steps. It takes patience and trust that we will reach that goal, and 'putting one foot in front of the other' is key in achieving success. I think about diabetes management and how overwhelming the thought of taking care of my diabetes for the rest of my life can be. If you really think about how much time and effort you will have to put in over a lifetime, you can get rather stressed over the matter. But, instead if you focus on that first step of taking care of yourself and move on as the day continues, it becomes less of a daunting task. I find this goes with weight loss, healthy eating, career paths, the list is endless. It is really easy to get caught up in the big picture without really focusing on those steps that need to be done to get there. It takes one step in the right direction to push you forward. If you need to pause and reflect after a few steps, that is O.K too, just remember when you're ready, all you have to do is put one foot in front of the other.